It’s been a long time we posted updates on the great work currently being done by our talented students and our awesome partners. To make up for lost time, here are highlights from the annual OSHA National Safety Stand-Down Day and our uBuild service event with Starbucks and Haley House. 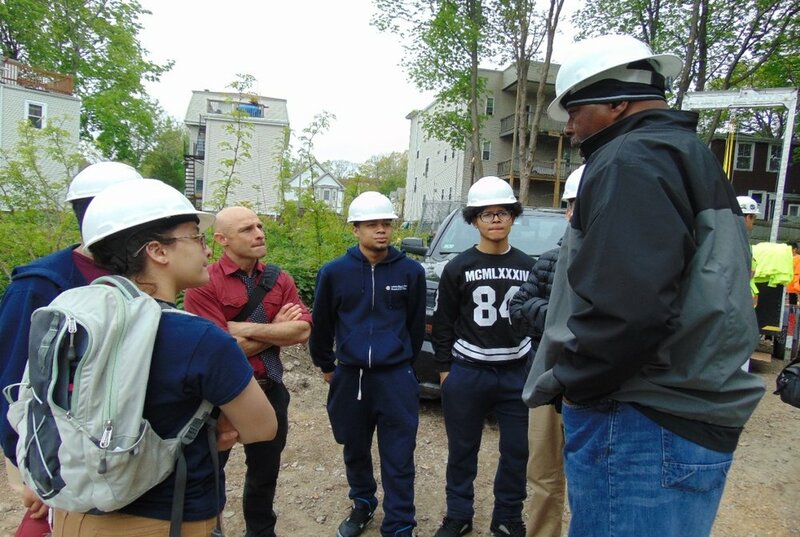 On May 10, we started off the month with our annual OSHA National Safety Stand-Down Day, hosted by YouthBuild Boston in partnership with Madison Park Technical Vocational High School and the New England Carpenters Training Fund. The morning was filled with warm welcomes by our Executive Director Ken Smith, who introduced the event participants to representatives from the Building Board of Regulations and Standards (BBRS), Inspectional Services Department (ISD), City of Boston Department of Neighborhood Development, and the OSHA Braintree Office. Pictured here: Tim Tudor (YouthBuild Boston), Darrell Boyd (City of Boston), Vinny Fanuele (Madison Park Technical Vocational High School), Ken Smith (YouthBuild Boston), and John Valverde (YouthBuild USA). The event then transitioned to safety workshops held by WhiteCap and Suffolk Construction, Marr Scaffolding & AGC, and the Gilbane Building Company on the topics of Personal Fall Arrest Systems, Boom Lift Safety and Ladder Safety, respectively. Charles Cofield (on the far right), member of the Carpenters Union, Local 327, talking to a group of students from the Margarita Muniz Academy. In June, we had the pleasure of working with our longtime partners, Starbucks and Haley House, to host a uBuild Service event. The event focused on garden improvements for the McKinley School garden where Haley House leads workshops and farms their produce. Through all of our hard effort we were able to make garden bed improvements with new plants and benches! Our uBuild program is designed for socially responsible companies like Starbucks and their employees to volunteer time and service to make a difference in the lives of students at YBB and underserved communities. For more information on uBuild, please click here. The following are before-and-after pictures of the McKinley School garden. We helped open the space by trimming bushes, shrubs and trees and planted more greens near the back to create consistency. Mulch was then added to all of the planted areas to help improve the soil around the plants.